System Level Design methodology, including Model-Based Design (MBD) and High Level Synthesis (HLS), reduces development times and improves the quality of system LSIs with growing gate counts and complexity. However, it requires users to study and adopt the tools and methodologies appropriate to their applications. Toshiba Information Systems draws on vast experience in customer development support in a wide variety of applications to offer high quality System Level Design service. Embedded system virtual platforms and/or models developed through MBD design flow allows users to verify their system before hardware manufacturing , contributing to improved development efficiency. Toshiba Information Systems develops models with appropriate abstraction levels for users' applications, optimizing simulation time. System verification before hardware manufacturing improves development efficiency. Allows verification of system performance. Supports simultaneous simulation of multiple models with different abstraction levels. 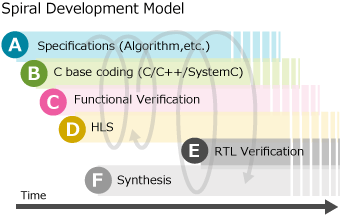 HLS that adopts spiral development ensures a rapid response to specification changes, contributing to development time optimization and quality improvement. 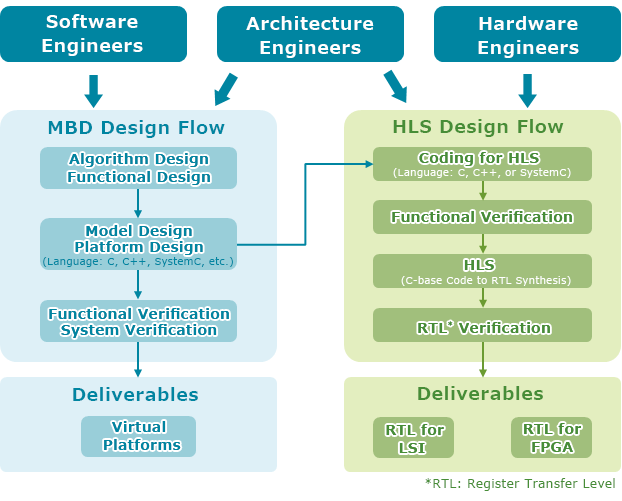 HLS-based design does not require the detailed design process of RTL-based design, and helps to cut development times. 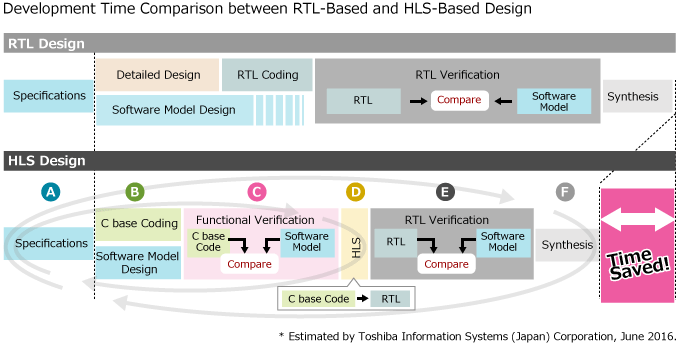 Toshiba Information Systems offers a flexible LSI development service using HLS that fully meets user requirements.